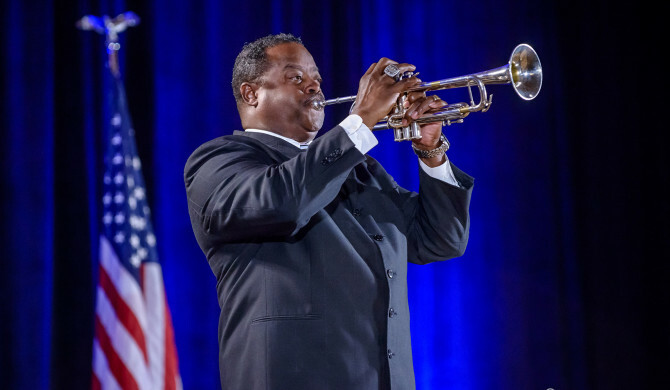 Phoenix, AZ – Award-winning trumpeter, Dr. Jesse McGuire, is always at-home with the National Anthem and this particular performance was a supreme rendition! Dr. McGuire raised goosebumps among the commissioners, legislators, directors and attendees with his moving performance of “The Star-Spangled Banner” during the opening session of the NAIC Conference in Phoenix, Arizona. What a fantastic way to start a corporate event! Throughout the years, McGuire has had the honor and privilege of performing for three U.S. presidents and at many major sporting events – most notably the 2000 Daytona 500, Game 7 of the 2001 World Series, and the 2014 NFL Playoff game between the Panthers and the 49ers. Jesse’s resume reads like a Who’s Who of soul, gospel, and rhythm and blues. Jessie McGuire has toured and recorded with some of the world’s biggest musicians, including Elton John, Paul Simon, James Brown, Stevie Wonder, Tower of Power, Wynton Marsalis, Seal and Hootie and the Blowfish. Even after performing for three presidents (Ronald Reagan, Bill Clinton and George W. Bush), playing at the Carnegie Hall and touring all over the world, McGuire said there are still two things that remain on his bucket list: opening for the Rolling Stones and performing at the Super Bowl! No doubt you surely would, Jesse McGuire! Providing outstanding customer service and quality photography are our top goals. Every client has different needs – Robert Keith Photo focuses on the details of your event! Please contact us today and let us help make your event memorable!